An elderly man can not remember how many times 4-5-6 he has to click on a flashlight mode. Ah, you flashed the latest Anduril onto a Q8? If a light is meant to be owned permanently by someone who needs an extra-simple interface, this might not be a good light for them. It’s meant more for enthusiasts, and muggle mode is intended for the occasions when someone else needs to borrow a light for a few hours or less. For permanent muggle use I’d suggest something with significantly less power so it won’t be prone to starting fires. Probably something with a built-in charger too. Olight S1R or S20R might be a good option. However, if it helps, the FW3A can be reflashed with something simpler. There are a few other UIs available already, including an Olight clone. And a simple UI is reasonably simple to make, if anyone wants a muggle-only firmware. It really depends on the recipient. I’ve known people close to a century old who were sharp as a tack, who could figure out a complex UI with no manual, then use it with ease. I’ve also known people who were totally lost even on simple interfaces, no matter how much others tried to help explain it. In stock form, the FW3A won’t be appropriate for the latter. But it does at least have a short-term use mode that the latter should be okay with. Id like to be put down for one flashlight, thanks! This looks like a cool light. Though how does this differentiate itself from say, a Jaxman E2L other than 100 more lumens? Smaller, e-switch + advanced UI, way more than 100 lumens diff unless u mean modded E2L, built for a clip, and the run time should be better than a comparably priced light if it’s 3 channels. Well then, I think I’d be interested in two of them at the $30.00 ea price range! Put me on the list for two please! Is there some rough computation guide for lumens to runtime (let’s assume the battery is a 3000mAh 18650 like an LG HG2 or INR18650-30Q)? I’ve been meaning to make a table for that… and there’s no time like the present. This is only an estimate, generated by plugging the firmware’s PWM values into a script with some guesses about the power draw and lumen output… but it should give people a rough idea what to expect. C and D would be the most practical imo. I’m using the latest Anduril on my 11,000 + lumen Q8 and I LOVE it! Ramping is ultra smooth and quick enough to not be a drag, still easy enough to select a desired level of output. Love it TK, thank you SO much! Thanks for compiling the table, ToyKeeper! This little light should be really handy for general EDC use, but with the benefit of some power up top when needed. Of course, it won’t run long at Turbo levels in a light this small as heat will become a paramount issue, but it’s really nice to have it there when you need it and TK gives us the ability to set a ramp ceiling at a nice usable level with a quick double click going to Turbo for that on-occasion need of a blast of light. That really makes it a great application in my opinion, I use the ramp ceiling at around 60-75% such that a double click really steps it up, this lets me easily control power drain for the best EDC capability to date. Sign me up for one please! Count me in for one please! 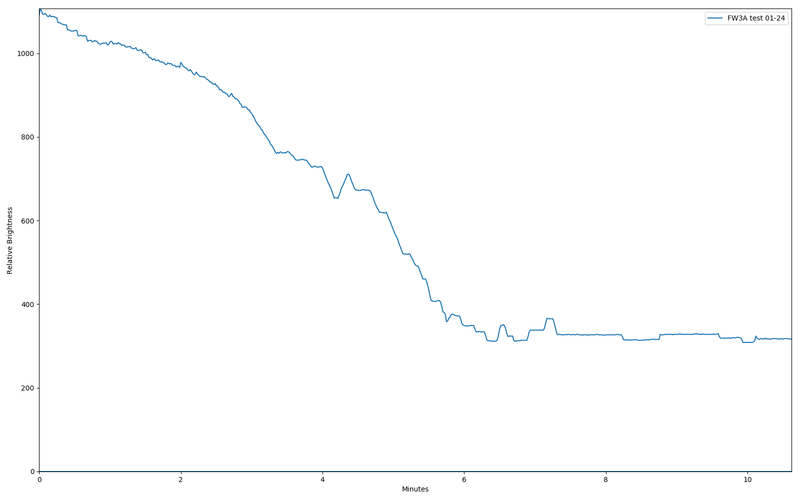 I didn’t have the graph earlier, but here’s how the latest thermal test looked. This started adjusting from the highest current-regulated level, which measured about 1100 lumens or close to 3 Amps. Output stabilized at about 7 minutes. I haven’t tested it on full FET yet, but I suspect it will probably need some changes in the response curves to make it react faster. Wow TK,the UI looks amazing. Thanks for the table and graph. Great work. Looking forward to playing with the light and using it as my EDC. Pepinfaxera, can you put me down for a second light please. Do you know at what temp about it stabilized at? For testing purposes, I set the limit intentionally pretty low. I was aiming for a stable level of about 200-400 lumens, and … that’s what I got. I think I told it that the ambient temperature was 20 C, and set the limit to 43 C, but I don’t remember exactly. I wanted it to exceed the limit pretty easily and then step down somewhere slightly above the 1×7135 level. I could have set the limit much higher, but that makes the regulation problem easier to solve… and I wanted to see how it behaved on a harder setting. Next I need to do full FET testing, since it’s the next step up in difficulty. Looks like it worked as intended. Be interesting to see what it would do around 55c limit. What can the components tolerate? Typically up around 100c right? I expect that turbo will overshoot the temperature limit before the light can settle to a stable level, so I wouldn’t put the limit too close to the hardware’s maximum tolerance. The thermal sensor is inside the tiny85, which doesn’t have a great thermal path to the emitters. The measurements lag behind by quite a bit, so the response is lagged too. It tries to compensate for this by guessing where the temperature will be in the future, but that doesn’t entirely eliminate the problem. So the actual temperature goes higher than the limit at first, if the power is turned up high enough. The firmware won’t allow a limit higher than 70 C… but it lets the user calibrate the sensor, so it’s not very hard to bypass that limit. On a related note, that could potentially save a bunch of button presses while configuring things. If you tell it room temperature is 1 click (1 C), and then set the limit to only 1 click (30 C + 1), it’ll effectively have the same results as if you set room temperature to 20 C and the limit to 50 C. But the tempcheck mode will display numbers about 20 C too low.